From No. 1 New York Times bestselling author Patricia Briggs comes the next thrilling Alpha and Omega novel - an extraordinary fantasy adventure set in the world of Mercy Thompson but with rules of its own . . . Perfect for fans of Ilona Andrews, Nalini Singh, Christine Feehan and J. R. Ward. Discover this page-turning Alpha and Omega novel, from the queen of urban fantasy Patricia Briggs. Further insight into the world of Charles and Anna. I can't wait to see what their next adventures are! Loved it, also Patricia Briggs you have the best sense of humour too!! I love most of Briggs books. I enjoyed this one also. I like how the characters grow without forgetting how they started. 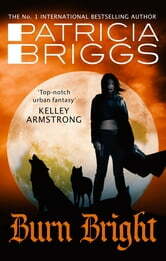 Whilst Bran is away in Mercy Thompson world Charles and his mate Anna are in charge of the Aspen Creek pack. When a strange call comes in from one of the Wildlings, wolves so broken they can no longer function even in a strong pack like Bran's, Anna and Charles uncover a sinister plot to kill or capture the Wildlings. It then becomes a race against time to save the Wildlings and uncover the traitor who has been selling the pack's secrets to persons unknown. This has all the characters we know and love/ hate. Charles and Anna, Leah, Asil, Tag, even Bran. We also meet a small group of badly damaged wolves, men who are in constant battle with their wolves, where one of the pair is insane, or worse. Many of the Wildlings are very old and hold deep dark secrets which 'someone' will stop at nothing to uncover. I liked this, it had all the brilliant characters and great writing that I have come to expect from Patricia Briggs, and yet I didn't love it. It didn't blow me away with joy the same way as Anne Bishop's Lake Silence did, maybe it was because I had trouble understanding why the baddies used such a hammer to crack a nut? Nevertheless, Patricia Briggs is an awesome writer, her plots and storytelling are outstanding and she has created two wonderful characters in Charles and Anna. Excellent book, engaging and exciting until the last pages. I recommend this book.